On westbound Church Hill Road, near Edmond Road, at about 8:09 am on November 27, motorist Nina Hawkins, 33, of Bridgeport, who was driving a 2000 Nissan Versa, struck the rear end of a 2006 Acura TSX driven by William McCarthy, 49, of Sandy Hook, according to police. There were no injuries. Police said they verbally warned Hawkins for following too closely. During heavy traffic at about 4:35 pm on November 26 on eastbound Interstate 84, near Exit 10, motorist Falguni Mehta, 41, of Lebanon, N.H., who was driving a 2007 Honda Odyssey minivan, struck the rear end of a 2016 Volvo XC-90 SUV driven by Margaret Bonner, 58, of Naugatuck, state police report. There were no injuries. Mehta received a verbal warning for failure to drive a reasonable distance apart. Police report that while on patrol at about 4:50 pm on November 26, they made a motor vehicle stop near 33 Berkshire Road and then learned that they held an arrest warrant for a passenger in that vehicle. Police charged Daniela Cefaloni, 21, of Danbury with evading responsibility and with making an improper turn in connection with a July 29 incident on Toddy Hill Road/Botsford Hill Road. Following arrest processing, police released Cefaloni on $500 bail for a December 12 appearance in Connecticut Superior Court in Danbury. At about 5:33 pm on November 26, motorist John Doucette, 25, of Pelham, N.Y., who was driving a 2017 Chevrolet Impala sedan eastward on Interstate 84, near Exit 9, stopped for traffic conditions, after which the Chevrolet was struck from behind by motorist Danella Bina, 34, of Danbury, who was driving a 2007 Chevrolet Colorado pickup truck, state police report. There were no injuries. State police issued Bina an infraction for following too closely and for driving without a valid license. Motorist Juliet Grover, 18, of Newtown was driving a 2004 Ford Explorer SUV eastward on Platts Hill Road, about 150 feet west of White Oak Farm Road, at about 11 am on November 25, when the Ford struck some curbing along the right road shoulder, hit a utility pole, and then rolled over, coming to rest on its wheels and against a tree. There were no injuries. Grover received an infraction for making a restricted turn, police said. State police report a three-vehicle chain-reaction accident in slowing traffic on eastbound Interstate 84, near Exit 9, about 5:29 pm on November 25. In that accident, motorist Edward Lang, 56, of Danvers, Mass., who was driving a 2010 Honda CR-V SUV, struck the rear end of a 2014 Nissan Frontier pickup truck driven by Nery DeJesus, 26, of Owings Mill, Md., pushing the Nissan into the rear end of a 2016 Volkswagen Jetta sedan driven by Douglas Davenport, 76, of Burlington. There were no injuries. Lang received an infraction for following too closely, according to state police. Police report they stopped a motor vehicle to investigate at about 11:37 pm on November 25, near 91 South Main Street. Police said they charged Jake Depace, 20, of Bethel with possession of a controlled substance/narcotics. Police released Depace for a December 12 court appearance to answer the charge. Police said they received a report informing them of erratic driving near 228 South Main Street about 8:23 pm on November 24. After locating the vehicle in question, police said they investigated and charged motorist Stacy Xanthos, 50, of Stratford with driving under the influence. Xanthos was released on $100 bail for a December 7 court appearance. A two-vehicle accident occurred on eastbound Church Hill Road near its intersection with Commerce Road at about 12:36 pm on November 22. Police said that as motorist Alissa Silber, 24, of Sandy Hook was driving a 2012 Ford Escape SUV through the intersection, traffic suddenly slowed, after which the Ford slowed and was then struck from behind by a 2008 Honda Accord driven by Joseph Kitzmiller, 22, of Sandy Hook. There were no injuries. Kitzmiller received a written warning for following too closely. At about 12:45 pm on November 22, motorist Yvette Merrifield, 47, of Middlebury, who was driving a 2005 Ford Escape SUV on Wasserman Way, was coming to a stop near Berkshire Road, when the Ford was struck from behind by a 1998 Jeep Wrangler SUV driven by Hanna Holmes, 17, of Sandy Hook. There were no injuries. Holmes received an infraction for following too closely and for violating a passenger restriction on young new drivers, police said. 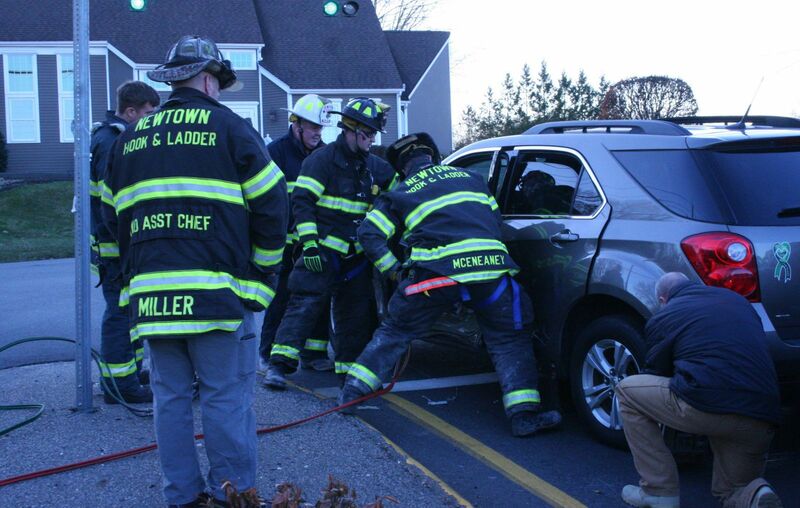 Motorist John Parsons, 79, of Southbury, who was driving a 2016 Buick Regal sedan eastward on Country Club Road at about 3:08 pm on November 22, stopped at a stop sign at its intersection with South Main Street, police said. At that time, motorist Michael Viesto, 19, of Newtown was driving a 1998 Oldsmobile 88 sedan southward on South Main Street. The Buick then entered the intersection and the two vehicles collided. There were no injuries. Parsons received an infraction for failure to grant the right of way at a stop sign, according to police. State police report a two-vehicle accident on westbound Interstate 84 in the area between Exit 11's off-ramp and on-ramp at about 7:57 am on November 21. In that incident, motorist Roland Meyer, 63, of Waterbury, who was driving a 2001 Acura TL sedan, struck a 2016 Ford F-150 pickup truck driven by Randall Haas, Jr, 30, of Southbury. There were no injuries. Meyer received a written warning for making an unsafe lane change. At about 6:20 pm on November 21, on eastbound Interstate 84, about 2,000 feet west of Exit 11, motorist Jihua Chen, 49, of Ossining, N.Y., who was driving a 2017 Toyota RAV-4 SUV, stopped for heavy traffic and was then struck from behind by motorist Taylor Caffrey, 24, of Middlebury, who was driving a 2006 Hyundai Elantra, according to state police. There were no injuries. Caffrey received an infraction for failure to drive a reasonable distance apart. Police report that at about 4:26 pm on November 20, motorist Johvany Ospina, 42, of Southington, who was driving a 2013 Hyundai Accent auto westward on Berkshire Road, near Toddy Hill Road, stopped for traffic conditions, after which westbound motorist Mary Hajj-Platt, 54, of Danbury, who was driving a 2016 Subaru Forester, struck the rear end of the Hyundai. There were no injuries. Police issued Hajj-Platt a written warning for failure to drive a reasonable distance apart.